Earlier this year, we took some time to learn about Vikings and the explorations of Leif Ericson. It was during this time that I found out about L'anse aux Meadows and, off-handedly said, "Wouldn't it be neat to actually go there." From that moment on the idea grew into a tentative plan and, with the sale of our home, a plan that was put into action. Since it was this place that inspired our long voyage north, last week we went to the very tip of the Northern Peninsula of Newfoundland to visit L'anse aux Meadows and ended up visiting two days in a row. The first time was in the middle of a nor'easter which made the day very cold, windy and rainy. That being said, it somewhat added to the experience as we were able to fully appreciate the construction techniques of the long, low, sod and timber long house where folks in character-dress huddled around fires. The visitor center at L'anse aux Meadows was very informative and includes a 15-minute video that summaries the site well. From evidence found at the site, specialists have determined that L'anse aux Meadows served as a elaborate encampment - a base, from which further exploration into modern day New Brunswick took place. The site was also used by the indigenous populations long before and after thethat dotted the site Vikings came and went. The Vikings would have been aware of this by the fire pits they found there among other things. During the film, an insightful theme was put forth: when the Vikings and the native peoples first met, probably on these shores, it was a reuniting of peoples that had long been separate. As the first humans migrated north from Africa, some set off west and some set off east, and at this place, the circle was made complete. A sculpture on site represents this theme: the meeting of two peoples completing a circle of migration. Parks Canada has recreated authentic Viking buildings and outfitting them with numerous authentic reproductions such as weapons, clothing, food, looms, etc. Everything is interactive; there are no signs saying don't touch and the character staff will engage you in their activities. The second day we visited, we were able to see how Vikings shaped bog iron into a nail. Jonah was conscripted as an apprentice for the task. We also visited Norstead, a private establishment across the road. I'll post a bit about that later. 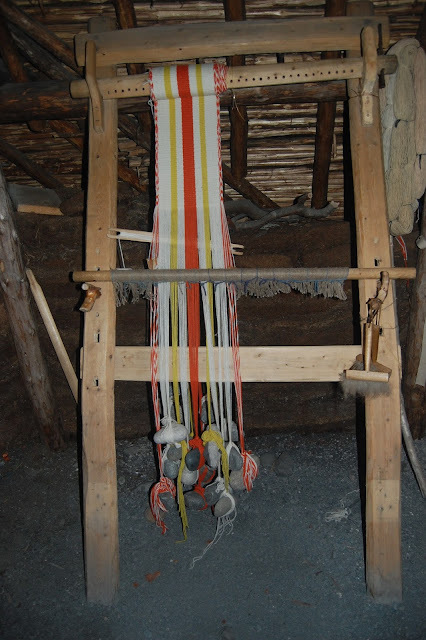 If you have to choose between the two - L'anse aux Meadows is a must. We all enjoyed the archaeological, historical, and interpretive aspects of the park as well as it's natural beauty - there is a hiking trail on site that shouldn't be missed.